WASHINGTON — President Obama and French President Francois Hollande are seeking to temper fears of escalating tensions between Russia and the West by asking President Vladimir Putin to join a coalition to fight the Islamic State. Speaking Tuesday at a White House press conference after a private meeting with Hollande, Obama said he would welcome Russia joining Western nations in the fight. But he also defended Turkey’s actions in shooting down a Russian fighter jet that the Turks claim veered into their airspace earlier in the day. Obama said Russian support for Syrian President Bashar Assad remains a barrier to a unified approach to attacking and defeating the Islamic State. Hollande is visiting a number of countries to ramp up the fight against the Islamic State, also known as ISIS or ISIL, which took credit for the Paris bombings that killed 130 people earlier this month. He is scheduled to meet with Putin as well as leaders of Canada, Italy, China and Germany. During the press conference in the White House East Room, Hollande and Obama spoke of intensifying the battle against ISIS in a show of solidarity, often hugging and shaking hands. “Sometimes we Americans are too shy to say so, but we’re not feeling shy today. 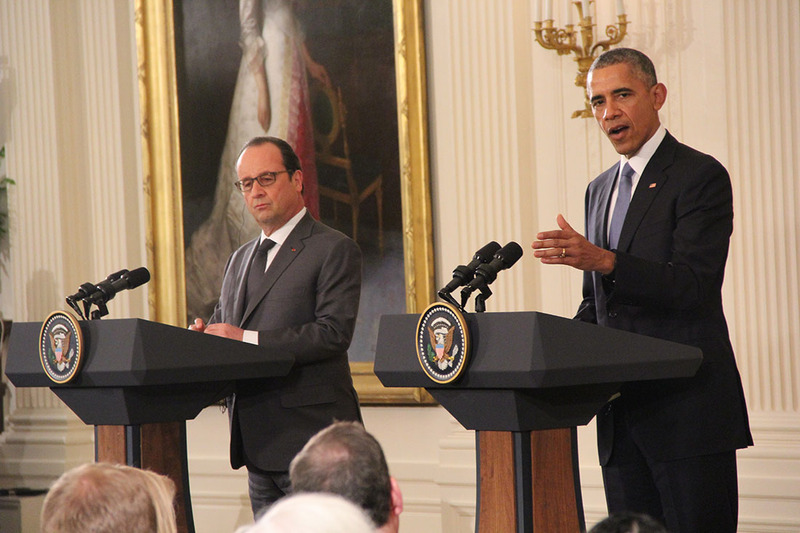 We Americans love France because we dedicate ourselves to the same ideals,” Obama said. In the French president’s first visit to the U.S. since the Paris attacks, Hollande expressed gratitude for the broad showing of support by Americans who displayed the French colors and lowered U.S. flags to half-staff. He also reiterated the need for increased solidarity among all nations fighting ISIS, including Russia. One of the main sticking points holding up Russia’s involvement in the 65-nation coalition against ISIS has been its longtime support for the Assad regime in Syria. The U.S., France and a number of other countries believe removing Assad from power is crucial to reaching a peaceful solution in Syria and strengthening the fight against the Islamic State. Obama also called on Russia to end its independent military operations in the Syrian region. In a conversation during peace talks in Vienna last week, Obama urged Putin to refocus on targeting ISIS instead of the Syrian rebel groups and others opposing Assad, facilitate a political transition for Assad and cooperate with the Vienna peace process. “Until that happens, it’s very difficult,” Obama said of the Syrian situation.